I spent the last day of my Cebu trip in Mactan Doctors' Hospital! We are currently in this age where people crave for an adventure to get away from life's 24/7 hustle. When we log on to our social media accounts, a minute wouldn't pass without you scrolling over a travel-related post from a friend or someone whom you follow. Their photos and videos would make you want to file a leave from your work or go on a road trip to paradise over the weekend. You can also overhear an office mate or a friend's never ending hang over from their recent vacation. However, accidents, minor or major, come unexpectedly though not safe to say inevitable in these trips. As much as we would want to go home safe and whole, the universe would come to a point of conspiring and bringing us to an unfortunate event. Well, that's what happened to me recently in my backpacking trip in Cebu. On the brighter side, it didn't catch me off guard. My boyfriend and I had a backpacking trip to Cebu and Siquijor for a couple of days. Prior to our travel, he decided to avail travel insurance for the both of us from Starr Companies - Starr International Insurance Philippines Branch for some reasons, (1) because he knows how clumsy and careless I get sometimes (lol) and (2) he believes that it's better to be safe than sorry. Despite his precautions, I had him rest assured that nothing would happen to me. We went whale shark watching, chasing waterfalls and did a lot of extreme activities for two days but I retired at our inn safe and unharmed. Come the 9th of May, 2018. We traveled from South Cebu to Sibonga for the first item in our itinerary - Simala Shrine. When we alighted at the bus stop we were told that we should take at least a tricycle or a habal-habal (single motorbike) to the shrine because it is several meters away from the highway. Since there were no tricycles around and we would want to take off early, we took the habal-habal. It's a five to eight minute drive from the jump off by motorbike. I always find joy and excitement in riding one and I found it delightful when the driver told us that he would then again pick is up when we are ready to leave the shrine. After quite some time, we decided to leave so we could go to the city. We waited for the habal driver from where he dropped us. It was only 9:30 in the morning but the place was getting dense and hot. Motorbikes are blessed with a lot of tourists that day that they keep coming back and forth with new ones. Just then, our driver came around with new guests. After a while, he signaled that he's ready to send us to the bus stop. When I hopped into the ride at the same time he was about to kick start, I accidentally slipped and my right leg touched the burning hot exhaust. I abruptly jumped off the motorbike and felt the pain on my leg. We were alarmed with the burn since it is a little big. We were taken aback when they applied gasoline on the affected area (definitely a no no!). After that, we proceeded to the city for out itinerary that day. To cut it short, I kind of brushed my burn off. Later that night, we noticed that the wound swelled and it burst when I was fast asleep. It was 2 in the morning and my boyfriend was panicking because I was frantically moving around looking for something that would ease the pain (sadly, the hotel didn't have any first aid kit). The next day, he insisted that we do not push through with our itinerary and go straight to the hospital instead. We looked for the nearest one and checked out to get the wound treated. 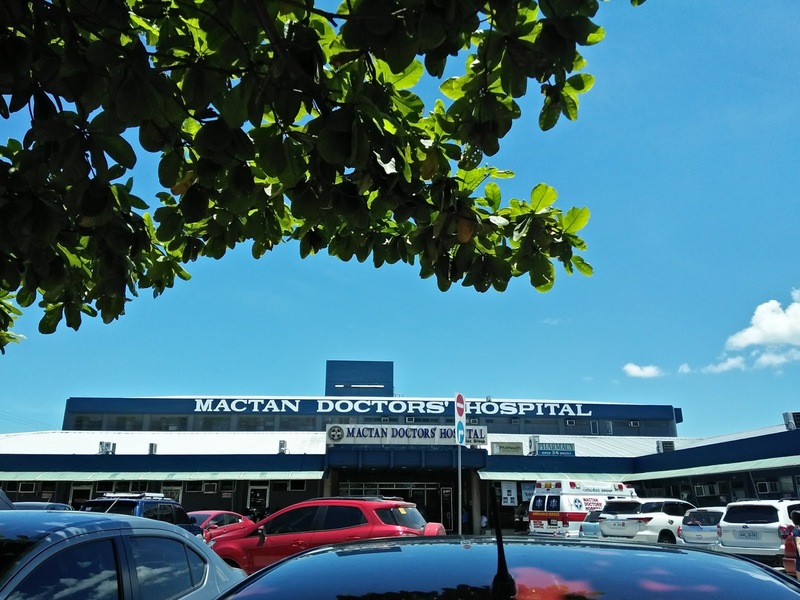 We found Mactan Doctors' Hospital. The doctor told us that mine was a second-degree burn and that it should have been given appropriate treatment right there and then. He prescribed Tetanus Human Immune Globulin, Tetanus Toxoid to be injected, Flamazine and some oral antibiotics. 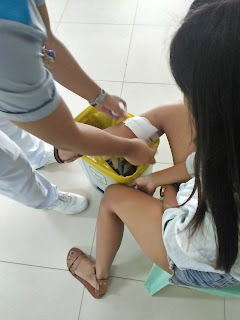 All in all, it took us around 3,000 php including the Doctor's Fee. My boyfriend's mom, whom we availed the insurance from, advised us to keep all of the documents from the hospital that we received. She forwarded through email the Starr Companies Travel Insurance Claim Form and told us to ask the doctor to fill in and accomplish a portion of it. When we arrived at Manila after that trip, we submitted all of the requirements to her and she forwarded it right away to the agency. We were told that it would only take us ten days to reimburse the medical expenses including the medicines that we have purchased. It was just a week after we went home from the trip, I received the reimbursement for my expenses. In the end, I was thankful to my boyfriend and his mom that they brought me to this. At least, I am rest assured that I'll be taken care of and that I was reminded that I should get insurance if I'll be letting my adrenaline junkie self take over all the time. Just like this cliche statement, it's true enough that "It's better to be safe than sorry".